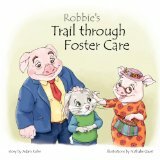 The Robbie Rabbit book series is an educational and dialogue-opening tool designed to help children in the foster care system adjust better to tough changes in their lives. Although written for children 5 to 10 years of age, older children will also appreciate the engaging stories as well as the illustrations on each page. With animals starring in the traditional human roles (child, caseworker, foster parent, etc. ), children quickly find themselves immersed in a non-threatening storyline they can actually relate to. This series has these goals: 1. To help children in out-of-home care adjust better to tough changes in their lives, 2. To open dialogue between children in care and foster/adoptive parents, caseworkers and therapists, 3. To help foster/adoptive parents and caseworkers gain insight into a child’s feelings and interpretation of the world around him.